These cool Smencils are made especially for sports team fundraising. Each scented pencil has a sports themed topper and wrapper. Different sports are included, such as basketball, football, and soccer. There are 50 Smencils in each bucket (10 each of 5 scents) and 10 buckets per case. There is a 1 case minimum order. You will earn a 43% profit. Free Shipping will add to your profit. These can be sold in school or at the game. Kids of all ages will love these unique pencils with yummy scents and collectible toppers. Plus, they are earth friendly! 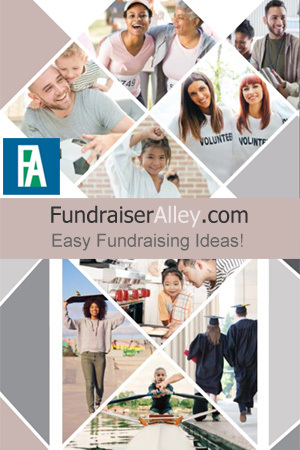 We recommend this Smencil fundraiser for any Sports Team. Smencils are considered an earth-friendly fundraiser. The way they are made is really unique in that they are made from tightly rolled sheets of recycled newspaper around #2 graphite writing cores. This is hardened to the consistency of wood pencils and soaked in gourmet liquid scents. 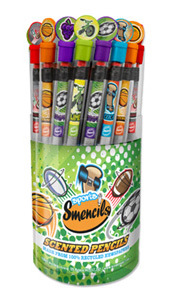 Each Smencil has its own corn-based biodegradable tube to keep it fresh and has a fun collectible top.